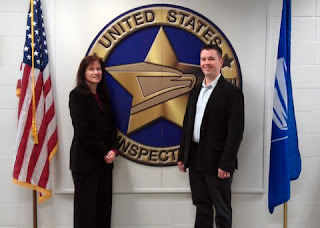 ODMP staff had the privilege of being invited to visit the United States Postal Inspection Service's Training Academy in Potomac, Maryland. Every new Postal Inspector and Postal Police Officer attends this FLETA accredited academy, which offers a complete curriculum customized for the unique needs of the USPIS. Numerous other federal agencies take advantage of its proximity to Washington, DC, and use the facility for in-service training. 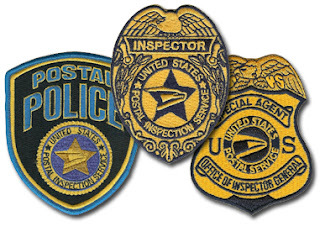 Originally created by Benjamin Franklin in 1772, the United States Postal Inspection Service is the oldest federal law enforcement agency in the country and even predates the formation of the United States. Over the past 200+ years, Postal Inspectors and Postal Police Officers have been protecting postal employees, postal customers, and the postal system from abuses by criminals. This fight has come at a steep price, claiming the lives of 12 Postal Inspectors and one Postal Police Officer. The Postal Service's Office of Inspector General, which is a separate and distinct agency from the USPIS, has also suffered one line of duty death. These brave men will always be remembered for their service and sacrifice in protecting America's laws. Click on their names to view their full memorials. Postal Inspector Charles Fitzgerald - Shot and killed in Clinton, Mississippi, September 23, 1908. Postal Inspector Elbert Lamberth - Shot and killed in Stantonville, Tennessee, August 16, 1917. Postal Inspector in Charge George Daniel - Drowned near Logan, Utah, September 1, 1919. Postal Inspector Levi Chance - Accidentally shot and killed in Savannah, Georgia, February 14, 1923. Postal Inspector Walter Ton - Killed in a plane crash near Bozeman, Montana, January 10, 1938. Postal Inspector Finton McMahon - Fell while conducting an investigation in Akron, Ohio, August 1, 1939. Postal Inspector Ernest Harkins - Shot and killed in Oklahoma City, Oklahoma, January, 12, 1949. Postal Inspector Bruce Shaffer - Auto accident in Poplar Bluff, Missouri, August 31, 1951. Investigative Aide Benedetto Spizzirri and Investigative Aide John McAuliffe - Shot and killed in Chicago, Illinois, March 14, 1960. Police Officer Michael Healy - Shot and killed in Chicago, Illinois, June 21, 1981. Postal Inspector Terrance Asbury - Auto accident in Los Angeles, California, February 3, 1990. Postal Inspector Robert Jones - Auto accident in Bowie, Maryland, July 14, 2000. Special Agent Greg Boss (USPS OIG) - Auto accident in Arapahoe County, Colorado, November 8, 2005.